My issue is that there is an affordable housing crisis. Communities across the country are facing low-income housing shortages – there is not a single county in the United States that can fill 100% of its low-wealth population’s need for safe, affordable housing. Under my leadership HATT & it’s affiliates will continue its efforts to do its part to positively address the needs of low-wealth individuals and families in Texarkana, Texas while tearing down negative stigmas and taking a “market level” business approach to our success. Texarkana USA is rich with history and has layers of opportunity for both cities to come together and seamlessly maximize its resources. ...it’s going to take a “non-intimidating collaboration” of various skills and talents that are passionate as well as desiring to move in the same direction to make a positive difference in Texarkana. ...I would like to work with like-minded organizations that also have a passion to strategically improve Texarkana’s infrastructure and quality of life. To me, leadership can be described as a natural or achieved skill that provides utilitarian methods to reach desired goals by leveraging individual’s various skill sets towards the success of an organization’s goals. As corny as this may sound, my one wish would be to have the ability to provide one wish to every single person with the stipulation that their wishes are of a positive nature. There is no “one size fits all” and whenever there is change, there is no doubt that someone will not like it, so everyone gets a wish provided that it positively improves their quality of life and does not negatively affect their neighbor’s quality of life. I am not a person that enjoys the spotlight, but if getting in the spotlight a necessity to achieving my goals, then “I’m your huckleberry”. Music was the catalyst to opening doors in my life. Its how I became who I am, and I’ve abandoned it for almost 25 years. I am now re-acquainting myself with my musical instruments and my love of music. It’s going to be a long road trip that I look forward to taking. What do you most love to do in Texarkana? What do you most love about Texarkana, in general? I look forward to the “What’s to Love TXK in the WeeklyLIFT!” Newsletters. This provides me with things to explore and special places to break bread, but on occasions I like to relax and just recharge for next weeks episodes. I’m open for more suggestions. Antonio began his professional career with the Federal Government in Defense Acquisitions. After 6 years with the Federal Government, he worked with several Fortune 500 companies. Thirteen years later he found his calling in the affordable housing industry. While working in the 4th largest Public Housing Agency in Atlanta, Georgia (which was troubled) Antonio provided technical assistance utilizing improved business processes to remove the PHA from “Troubled” to “High Performing”. Antonio left Atlanta and started a consulting firm that specialized in the recovery of troubled housing authorities. After improving the bottom lines of PHAs from Connecticut to the Caribbean, Antonio decided to get off the road and focus on family. 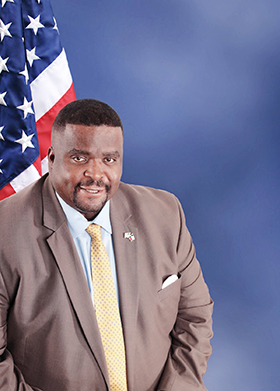 After working 5 years at Mobile Development Enterprises as Vice President of Asset Management and Metrics Analysis in Mobile, Alabama, Antonio decided to bring his skills to Texarkana, Tx as CEO of the Housing Authority of the City of Texarkana, Texas. He has been married to Cynthia for 26 years and and has four children and two grandchildren. Antonio shared this: “In the playgrounds of my youth, if I were picked to play on a stacked team in a competitive sport, I would typically volunteer to switch teams to try to even the odds. That attitude still prevails in my DNA. Comments on "PROFILE: Antonio D. Williams"